This list gives you an idea of the best of Phi Phi island for those who like and need to get out there and just go active...!!! You would need about 5-8 days to get though all these, a lot of energy and a fun loving heart. Diving on Hin Muang. Hin Muang is a rock formation in the middle Of the Andaman sea that rises sharply from the seabed to a pinnacle that breaks the surface at low tides. On one side is is 30 meters deep and on the other it is an impressive 60 meters. The sheer variety of marine life on the exposed cliff faces of the pinnacle astound your visual senses. Large pelagic species, like whale shark and ray glide by, some as large as five meters, and blend majestically with the large schools of Trevally. 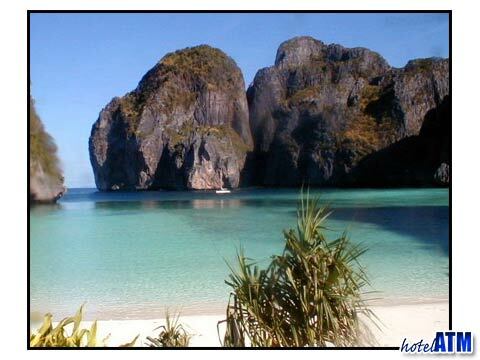 Hin Muang is A 45 minute fast speedboat ride from Phi Phi Island and diving there is geared for the experienced. One of my favourite memories of Phi Phi Island is paddling under the cliffs of Phi Phi Don on a sunset kayak trip. Just paddling away, in tune with nature is a picture I returned to when I want to give myself a lift. The sun going down between the cliffs and Wang Long is magical. Kayaking takes a bit of energy but the sit on kayaks mean that it is not technical and the sea is a delightful 29 degrees. In 1997 there was a large car ferry that took people from Phuket island to Phi Phi island which sank just off Shark Point just to the north west of the Phi Phi Don. 30 meters long and 14 meters tall this wreck has worked very well for divers. Diving the King Cruiser wreck is one of the premier drivers on the island. Expect to see lion fish and schools of predator barracudas searching the wreck for an easy meal. The King Cruiser Wreck is just 500 meters from Shark Point dive site where you can see leopard shark. Maya Bay is where Leonardo DiCaprio made his famous film 'The Beach' and is a wondrous setting for one of the best parties on the island. Overnighting on Maya Bay, sleeping on a live-aboard boat is an organised trip that leaves every day at 4.00 PM. At Phi Phi Ley you are able to do some snorkeling on the coral reef and kayak close under the cliffs of Pi Ley. The fun part of this trip is meeting new people and just hanging out in a truly glorious beach setting, just like Leonardo did in the movie. Walk to View Point. 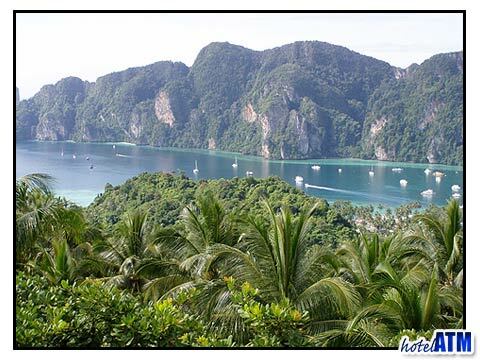 The Viewpoint walk starts at the back of the main village and takes about 40 minutes on a made up path under the shade of the coconut grove to the classic viewpoint look out where you can see both of the famous Bays of Phi Ph Don. Arriving at sunset gives you a classic moment though arriving before 9am lets you see the entire Phi Phi Don cliff front bathed in sun. Snorkeling with the sharks. Get up early and swim out off long beach and see up to 2 meter long Black Tip Reef Sharks. Timid on the whole , these sharks are classic and magnificent. For those who enjoy facing their fears or have a phobia they would like to exercise, I would thoroughly recommend this tour. The tours can be booked online to ensure spaces. Visit Monkey Beach. Yung Gassem or Monkey Beach is the untouched bay next to Loh Dalum on Phi Phi Don. It is just a short kayak trip 10 minutes, from Loh Dalum and is the perfect place to waste an afternoon in paradise. The jungle covered hinterland is like something out of a 'Spielberg' movie. Primeval monkeys come down from the dense jungle and play on the golden sands of the beach. Be careful these are wild animals. Snorkel Hin Klang. This remote offshore reef is in a class of it's own. This is a serious adventure that requires good swimming skills as the tides can be very strong. If you are up for it, the oval coral reef is a perfect isolated marine park full of colourful corals and covered with marine life. Visit Bamboo Island. The National park boasts a wonderful circular reef the finest golden sand on the islands. In the north of Phi Phi, this island is peaceful and remote. Opposite the luxury resorts on Laem Tong beach, Bamboo Island National Park is a great place to laze away a few hours listening to the sea breezes whistle through the Casuarina trees and the waves on the sea shore. If you want to spend some quality time in a luxury resort try checking in to the Zeavola Phi Phi Resort, Holiday Inn Phi Phi Island or Phi Phi Island Village Resort And Spa. These 5 and 4 star resorts have all the mainland facilities you would expect and ensure you see the best of the islands while maintaining the standards of the discerning traveller. There are no cars. The endless beaches, the 20 km of coral reef means you can still be exploring the island after 10 years never mind a week trip.